If you’ve been to Graceland you’ve probably seen them. Now you can own them. Two of Elvis Presley’s private planes, the Lisa Marie and Hound Dog II, both of which have been on display at Graceland for more than thirty years, are headed for the auction block. One plane is a Convair 880 Jet that Elvis purchased from Delta Air Lines on April 17, 1975 for $250,000, refurbished, and rechristened the “Lisa Marie” in honor of his daughter. 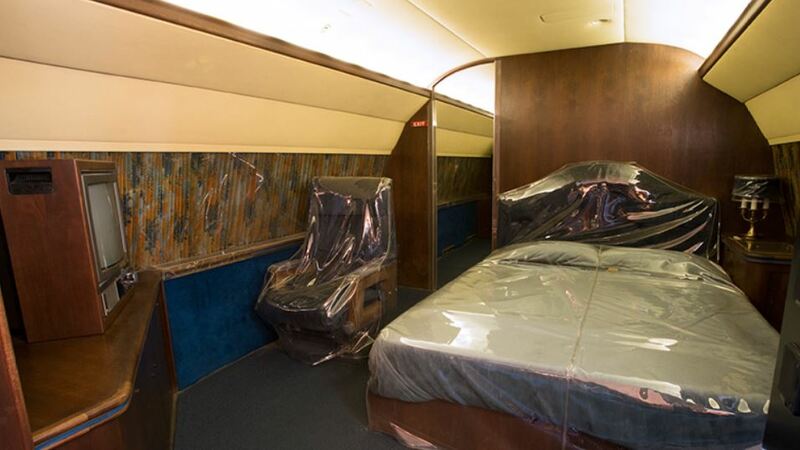 Inside the airplane cabin there’s lounge and club seating area, a conference/dining table, a club room and a master bedroom with a custom-made queen size bed, an executive bathroom with gold faucets and gold washbasin, a videotape system linked to four televisions and a stereo system with fifty speakers. The Hound Dog II is a Lockheed JetStar that Elvis also purchased in 1975 for about $900,000 while waiting for Lisa Marie make-over to be completed. The planes cannot be flown and are being sold as one lot, with an option to buy a piece of land next to Graceland (but unaffiliated with the Presley Museum) to display them. Here a video from Julien’s Auctions, which is taking sealed bids for the plane through February 2, 2015 at 5 p.m. PST.